You are here: Home / WordPress Tutorial For Beginners / How do I put content in the sidebar or footer of my website? Most WordPress themes have a sidebar. 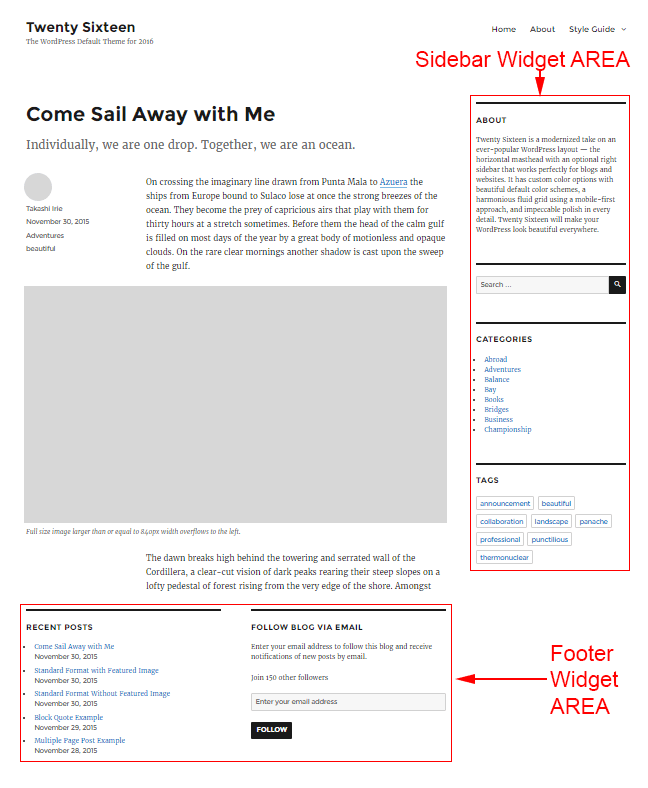 Many also have content areas at the bottom of the site called Footers. 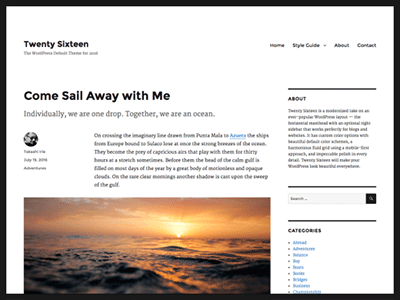 In WordPress, sidebars and footers are called Widget Areas. Available Widgets on the left. Widget Areas on the right. is like an app that contains some kind of content. A widget could contain a custom navigation menu, a search box or an empty box where you can type your own text. is a position in your site, such as the Sidebar. Just drag a Widget, from the left hand side of the screen. Into a Widget Area, on the right hand side of the screen. Some widgets do not need any configuration. For instance, the Calendar Widget displays a calendar and highlights the dates of posts you’ve published that month. Some widgets do need extra configuration. For instance, the text widget is an empty text box that you can type your own text into. You drag the Text Widget from the left hand side of the screen, into the Sidebar Widget Area on the right hand side of the screen. Then you type a title into the Title: box and some text into the Content: box. Now the sidebar area of your website displays the title and text you just typed. Search: visitors can search inside your website. Recent Posts: automatically displays a list of links to your most recent blog posts. Text: a text entry box where you can type your own text. WordPress has a set of add-ons called Plugins. There are over 30,000 plugins available for WordPress. Each of these plugins will add some kind of extra feature to your WordPress website. Some times, after you install a plugin (or add on) you will find that extra Widgets have been added to the Available Widgets section of the Widgets page in WordPress. For instance, the Simple Social Icons plugin adds a widget that you can put in your sidebar or footer (if your theme has sidebars and footers). You then configure the widget by typing your Facebook and Twitter URLs into the appropriate boxes. Now your site visitors can see a Facebook icon in your sidebar. If they click the icon they will see your Facebook page. Previous Post: « How do I change the look of my blog listing pages?